"It's not romantic," Torrey says. "It's physics. For every letter there is an equal and opposite, you know...letter." Sheila's life is built of little thievings. Adrift in her mid-thirties, she sleeps in fragments, ditches her temp jobs, eavesdrops on her neighbor's Skype calls, and keeps a stolen letter in her nightstand, penned by a UPS driver she barely knows. Her mother is stifling and her father is a bad memory. Her only friends are her mysterious, slovenly neighbor Vinnie and his daughter Torrey, a quirky twelve-year-old coping with a recent tragedy. When her grandmother Rosamond dies, Sheila inherits a box of secret love letters from Harold C. Carr--a man who is not her grandfather. In spite of herself, Sheila gets caught up in the legacy of the affair, piecing together her grandmother's past and forging bonds with Torrey and Vinnie as intense and fragile as the crumbling pages in Rosamond's shoebox. As they get closer to unraveling the truth, Sheila grows almost as obsessed with the letters as the man who wrote them. Somewhere, there's an answering stack of letters--written in Rosamond's hand--and Sheila can't stop until she uncovers the rest of the story. 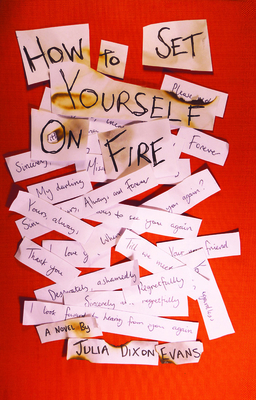 Threaded with wry humor and the ache of love lost or left behind, How to Set Yourself on Fire establishes Julia Dixon Evans as a rising talent in the vein of Shirley Jackson and Lindsay Hunter.